So we’re buying a house. And it’s scary. It doesn’t matter if it’s your first time, or fifth, home buying is a nerve-wracking, emotional process. You know how it is, you daydream about painting that cute little entry way, how you will organize the kitchen, or how you will mount that future 70-inch TV (oh wait, that was my husband’s fantasy, not mine), in the highest hopes the sellers accept your offer. Then when you GET IT (!) and have a 7+ hour drive to your new city for the home inspection, you must have my favorite healthy road trip snacks packed for your latest adventure! I’m not a stress-eater, but as we were anxiously waiting word on our offer, I ate an entire bag of chips. I mean, they were plantain and sweet potato chips, BUT STILL! Road tripping can be just as bad – hours in a car with very little ‘healthy’ options to eat in site. Trust me, I get it – eight moves in less than ten years. Yeah, fun times. Although we always try and pack a small cooler with healthy goodies like veggies, deli meat, fruit, and water, sometimes grabbing pre-packed options are easy and fast. Here are my favorite healthy pre-packed snacks for your next road trip. Hello sweet and crunchy! I love this super healthified version of trail mix because of the crunchy almonds and cashews, toasted coconut, dried blueberries, and my favorite – the lemon-infused apples. 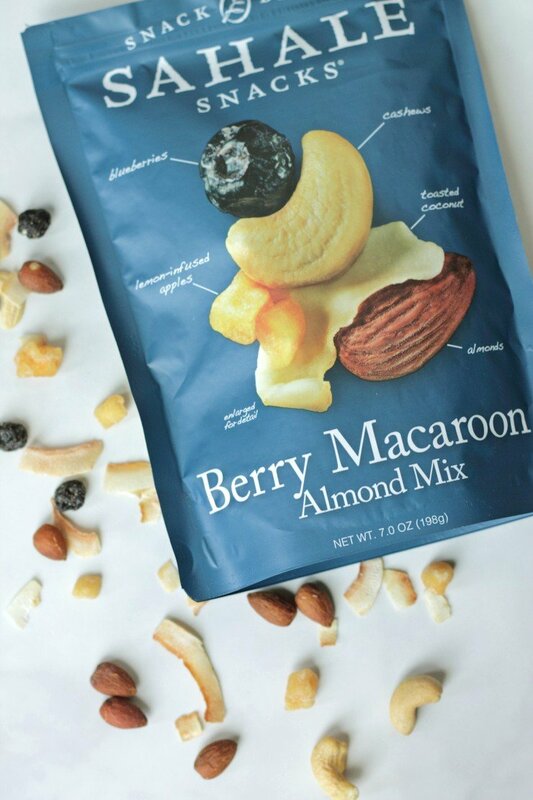 This Sahale Berry Macaroon Almond Mix isn’t overly sweet or heavy but has an amazing flavor with the dried fruit and coconutty goodness. You can’t get better than a bar made with all-natural ingredients, no added sugar, and gluten-free, dairy-free, and soy-free. 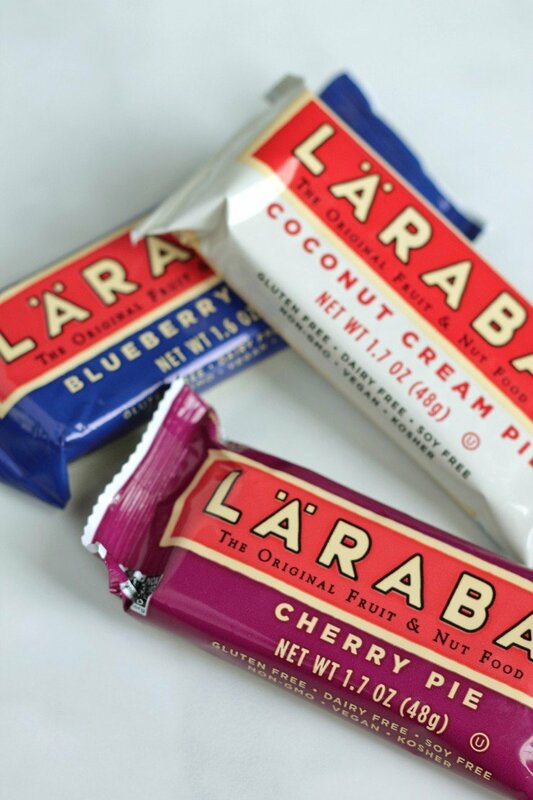 I love Larabars when I need a sweet fix on the go. My favorite flavor is coconut cream, but there are SO many varieties it will be hard to pick just one! DON’T LAUGH! I’m not some kooky celebrity that only eats baby food, I promise. But listen, when I’m in a bind, sometimes I pick up these squeezable packets for my son. And when curiosity gets the best of me, I try them. 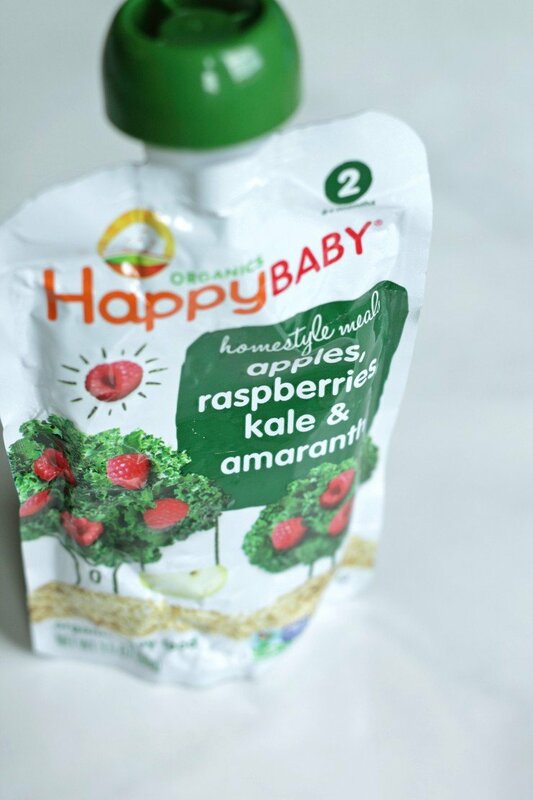 I don’t feel guilty or weird at all grabbing this packet of apples, raspberries, kale & amaranth for myself because it’s delicious and a good source of vitamins. I’ll throw one of these back with my toddler any day. 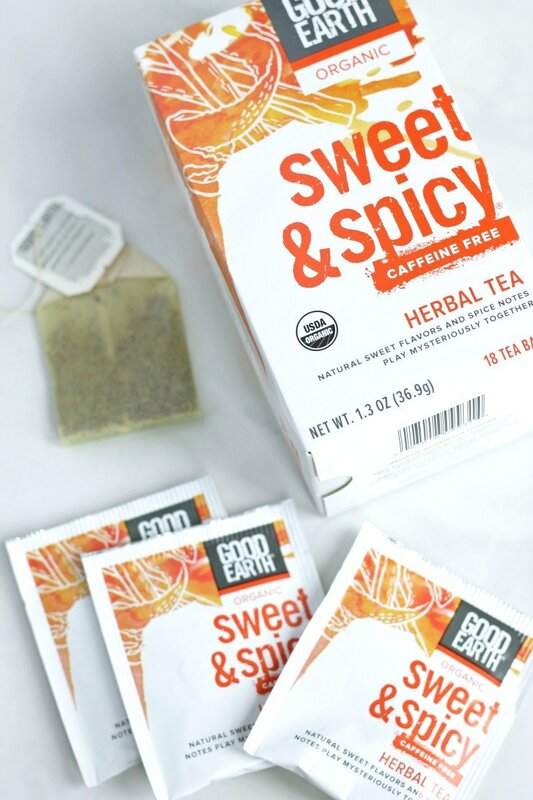 This Good Earth tea will convert any non-tea drinker. I love the sweet hints of cinnamon, honey, and orange in this caffeine-free tea. Hot or cold, doesn’t matter – it’s good. And when that cute little tea string has a insightful quote like, “I don’t want to not live because of my fear of what could happen”, it puts my nervous house-buying jitters to rest. I also love my girl Rachel’s amazing herbal blends over at Teamotions. Check them out here. Ok so this is a little bit of a cheat. I do toast my coconut chips before consumption, because it makes a world of difference. But you can buy coconut chips almost anywhere. And eat them plain or toasted. In fact, I got this bag at a grocery outlet for $1.99. Unheard of! 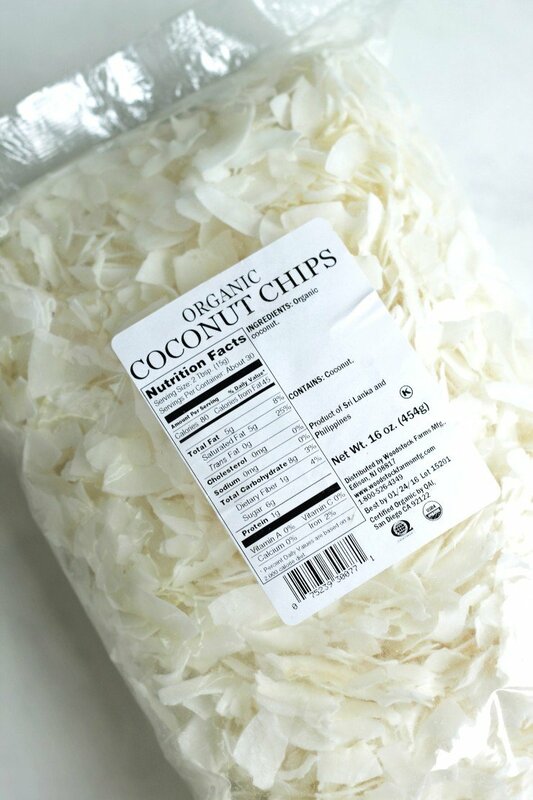 If you’re a fan of crunchy and coconut, toasted coconut chips are where it’s at. I mean, can you get any more convenient?! Plus who doesn’t love nut butter? 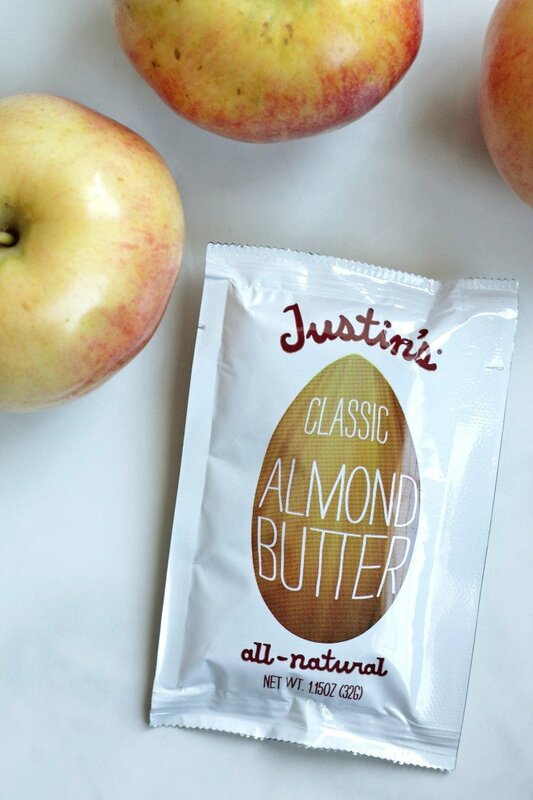 Grab one of these Justin’s almond butter packets and squeeze it all over your favorite fruit, crackers, or vegetables. Squeezing directly in your mouth is completely acceptable too. Those are just a few of my favorites at the moment. 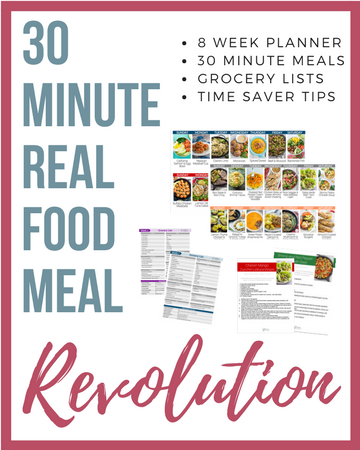 What are your go-to healthy snacks for convenience? Don’t forget to check out these five uncommon snacks that you also MUST try! Oh girl! Although I’m not the allergy queen, I am the queen of hunger so I always have snacks on hand too!! Thanks Cara! Yes so hectic but SO exciting. I cannot wait to move in and decorate!! We are on the SAME PAGE today, girl! That’s too funny! And I’ve got Justin’s in my round up as well 😉 (although I went with the peanut butter cups, haha) Love these ideas! Larabars are definitely one of my favorite bars to pack because I don’t have to worry about chocolate melting in most of them! I haven’t seen that mix, but it looks delicious! Larabars are the best! THE BEST. I must try their mint chocolate one asap! I LOVE coconut flakes! And I just tried plantain chips this week and they’re definitely interesting! Awesome list! 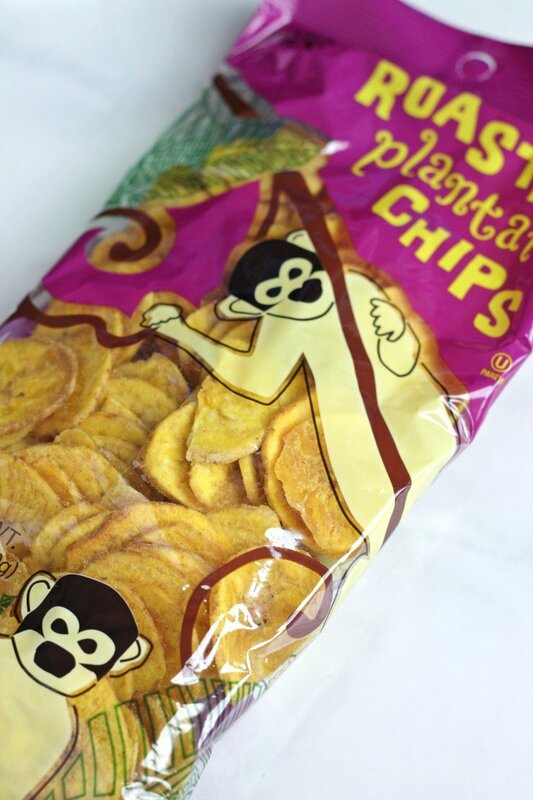 I love all of these, but have not tried plantain chips from trader joe’s…I need those in my life! Oh you MUST MUST! My mom doesn’t have a TJ’s near her, but I got her hooked so whenever I go home I buy like 10 bags so she has a stash! Right?! You seriously can’t go wrong with any of them! Yum i love these ideas! I love Larabars! My favorite is peanut butter chocolate chip! Ooooo I must try that one – it sounds decadent! I love this post! My husband and I have been getting pretty bored with our usual go-to road-trip snacks of almonds and oat-and-honey granola bars. When I’m packing and getting things ready for travel I usually don’t have time to start investigating new snacks. So I really appreciate your having done this for me and all of your readers. Right off the bat I know I’m going to love the coconut chips, the plantain chips, and the Sahale Berry Macaroon Almond Mix . And I’m ready to try the Larabars you have pictured. Woo-hoo to discovering new favorites! Thank you sooo much. 🙂 PS: I’m pinning this to Pinterest! Oh I’m so glad this post is helpful for you Denay! I hear ya about the same ‘ol same ‘ol snacks. I love finding new ones to try and mix it up a bit. You will love ALL of these! Thanks friend! This is such a great list! I am always so much happier with road trips when I remember to pack healthy snacks like the ones in your list… it helps you start off your trip feeling better than when you buy gas station or drive through food on your drive! Thanks Emily! I agree. Gas station food is always such a bust. BLEH! Thank you for this! We are going to be going on a roadtrip very soon, so this is definitely helpful! I can’t wait! This is awesome!! We are huge road trippers and like to eat while we go instead of stopping at restaurants. Thanks for the ideas! Stopping takes so much time out of the trip! Especially if your toddler is soundly sleeping in the back, there’s no WAY I will stop! HA! All of these look really good, but the coconut chips are my favorite! Thank you for so many ideas! You’re so welcome Starr. Coconut chips are da bomb! I really needed this! Chips are my go-to travel snack – I need to pick some healthier alternatives! I need that crunch in my life so chips are where it’s at for me too Ruthie. Thanks! Also, those Sahale snacks look great — i need to find some! Thanks Patricia! And virtual fist pump for baby food snacking! 😉 Yes RUN and get the Sahale snacks. You won’t be disappointed! I see some of my favorites on your list Chrissa. Buying a new house runs the gamut of emotions. It’s fun and scary! Good luck with your offer. So much yum! I love all of these ideas…Larabars are so good! Great list! I love Larabars! How can you not?! Thanks Heather! Great ideas! I love apple chips and plain air-popped popcorn – but Lara Bars are winners too! ME TOO! I make my own apple chips since getting my food dehydrator and it’s a serious addiction! Thanks Cassandra! I just started eating coconut chips and I’m addicted! I’ll have to try some of the others you suggested too! Aren’t they soooo good?! I love finding good deals on them and toasting them at home. Because the pre-made ones are so expensive and you barely get any! We always have an assortment of snacks on our road trips otherwise we end up with fast food. Such a good strategy. Fast food = BLEH. I mean, sometimes it’s necessary but I feel like such poo after I eat it! I think I’ll feel less guilty about my snacking if I try a few of these, especially the chips! I’m a carb snacker. 😉 Thanks for linking up at #welcomehomewednesdays can’t wait to see what you have for us this week! I am totally a carb snacker too! So the chips definitely hit the spot! Thanks Rebecca. Great ideas here. Those applesauce pouch things are sooo handy for in the car. 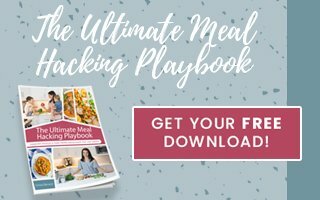 And I think I’ll check out the almond butter packets- I always need ideas for good protein for the kiddos! I’m so so so glad this is helpful for you Kezia! Have a safe trip!